I wanted to share a super easy appetizer with you that I recently brought to a Spring boil/pool party. It is even easier that Ms. Sandra Lee's Semi-Homemade. Moreover, it is a healthy snack alternative. I have always thought that presentation was key, so here it goes. Go to the grocery store and purchase Sabra roasted red pepper hummus, a jar of roasted red peppers, a jar of baby peppers, and a small jar of jalepenos. Place the hummus, roasted peppers, a dozen or so baby peppers, and a few jalepenos in a food processor and blend for about 20-30 seconds. Place the mixture in the center of a nice plate or platter. Garnish atop with more red peppers and baby peppers. 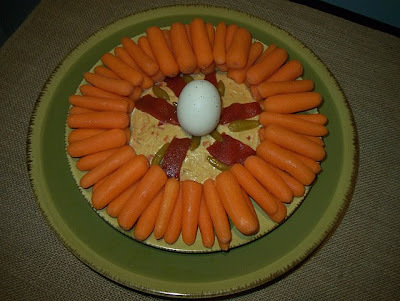 Since it was the Easter season, I surrounded the mixture with baby carrots. I also placed an egg in the center. Easy, breezy, seasonal..... 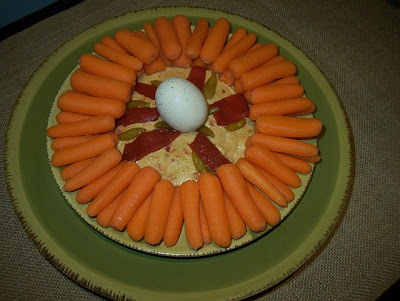 It is a wonder what presentation will do when cooking just isn't your thing. Watch out Sandra Lee. Do not forget my give away: Click here! Pretty! Is it pretty spicy? Yes, Terry, it does have a quick, but I like all things spicy. You can certainly adjust the jalepenos or do not put them at all. Thanks for stopping by. I'm not a real big fan of hummus but anything with red peppers or jalepenos is worth a try! Your blogs haven't failed to thrill me!